Here's my jacket reveal. It's a snug fit. The sleeves are narrow, but not too tight. The fabric is warm. I'll be able to wear it in the fall and spring on cool days. Today, I paired it with my Rhonda's shirred wrist sleeve top and my Christine Jonson's center seam pants. I can also wear it with a slim knit dress. More style options on the rise as I add new staples to my wardrobe. 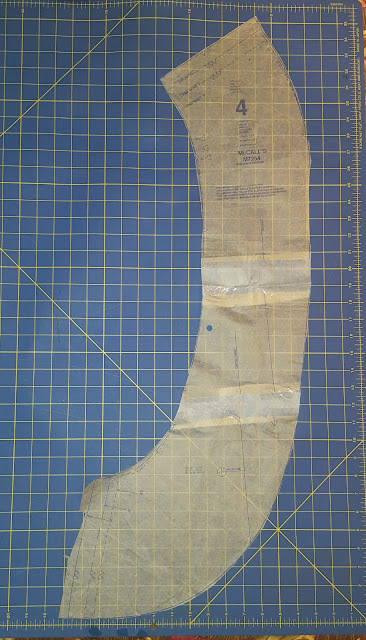 If you want to learn more about the fitting, my likes, and the construction process, please read my Notes of a Pattern post. 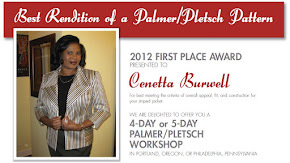 Let me know what you think and I welcome any questions about the process. 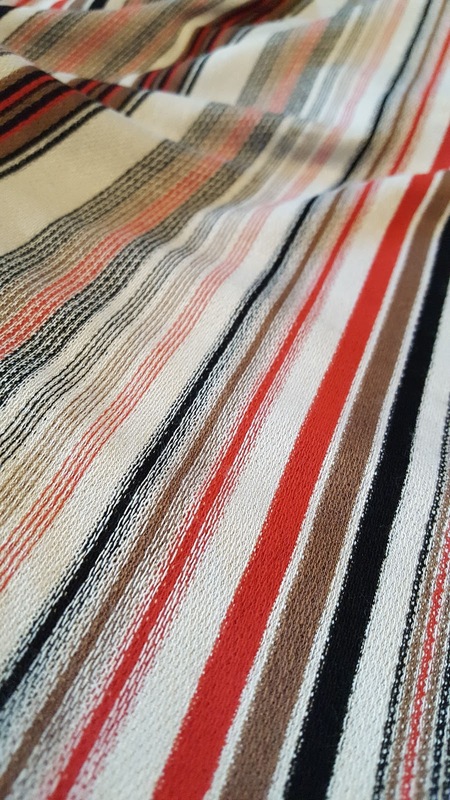 I paired V1314 with this beautiful Taupe/Mocha/Black/Red stretch striped cotton terry (#308113). I love the color combination. Each color can be used to make a cardigan, jacket, or coat to complete a well put together stylish outfit. The coloration and the stripes are classic 70's. The knit is lightweight with a lovely drape that falls close to the body. It feels good on and is super easy to work with. If you follow my blog, you know I've used this pattern many time. I just can't stop finding new ways to use Vogue 1314 Tracy Reese Pullover Ruched dress. 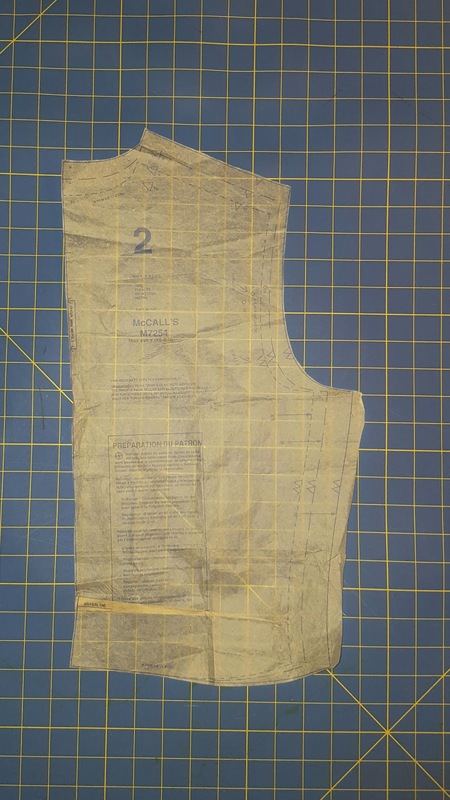 Actually, I've used the front and back lining pattern pieces (no ruching for me) to create over a dozen looks. Can I say it's my favorite TNT pullover dress pattern. For this dress I lengthen it by several inches and added slits to the side. No other changes to it beyond the fit, which were made years ago. My challenge was placement of the horizontal stripes. I was careful to make sure the pattern of the stripes below the bust was consistent around my body. 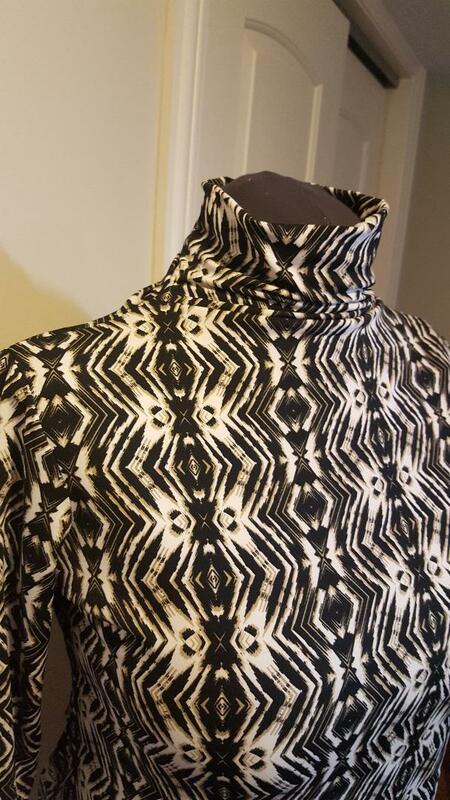 My fit adjustments resulted in a bust dart, and it was important for me to try to reduce the appearance of it without disrupting the pattern of the stripes. I'm very pleased with it and hope to get plenty of wear out of it. Do I like it? You bet. Will I make it again? YES. Do I recommend it? Yes, to every level of sewist. This is a winner! If you interested in reading about my other versions of this dress, please click here. I think I want a few more yards of Mood's Black Stretch Viscose Nylon Novelty knit. I love this fabric. It is a beefy textured knit that falls away from the body, creating a stiff drape. 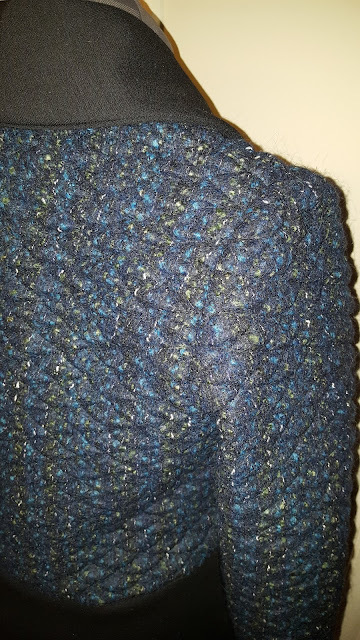 The hand is not as smooth as a rayon knit, but it's not hard or scratchy either. It wears like a comfortable sweatshirt knit. I can also see it used to make a fall/spring knit coat. 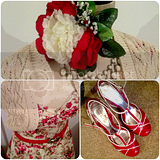 When the box arrived at my door, I immediately started working on this dress project. I spliced Christine Jonson's funnel neck knit top, travel trio 1204 with Mc7386 skirt. CJ's funnel neck top is quickly becoming one of my favorite tops. It's easy,stylish, and comfortable. This year I decided to give myself a little challenge to see how many different looks I could come up with using a few patterns. This month, I'm using CJ's Travel Trio. To create this dress, I simply overlaid the skirt pattern where the waistline is indicated and marked my desired length. That's it! Of course, I had to do some tweaking on the curve of the skirt. But that wasn't difficult and only took a few cycles of trying the dress on, pinning, and making the adjustments. I was finished in just a few hours. I really like how this dress turned out. A simple little black dress with a few interesting details. Perfect for me! Using the beefier textured knit for the top and the skirt does change the intended drape. First the funnel: It stands up! 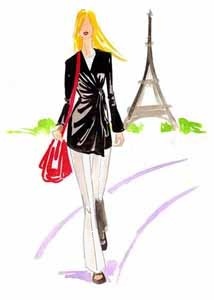 But, when made in a jersey knit, it fall about the neck creating folds. The same affect for the hem of the skirt. It stands out instead of falling close to the body. I love it! Something different! So far so good with this segment of my little challenge. The fabric and style are a perfect match. One that I will certainly use again. PS - My complete review on the funnel neck top is my blog here. Sunday afternoon I was sitting in my sewing room thinking about what to make next. I was really leaning toward cutting out a new project. 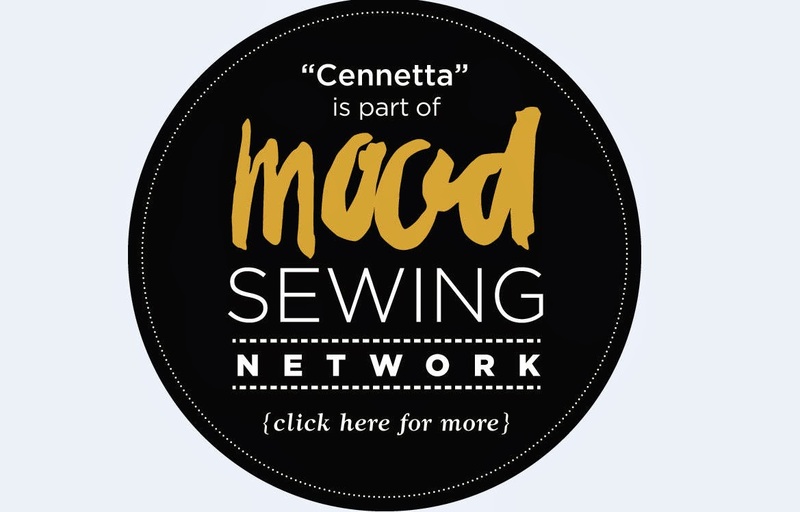 While sitting there, I thought about the great month of sewing I just had. All in all I was feeling pretty good about my sewing success thus far. So, I got up and began to look through my bag of projects to sew in 2019. But before I could decide on what next, my thoughts turned to the box of UFO's that I need to address. I asked myself new project or finish something already cut out? This time I chose to go with the already cut out. Surprisingly, I couldn't remember why I put this one aside other than the season changed before I finished it. Anyway, I'd like to share some of the details on the pattern and the fit adjustments that I had to make it "my size". 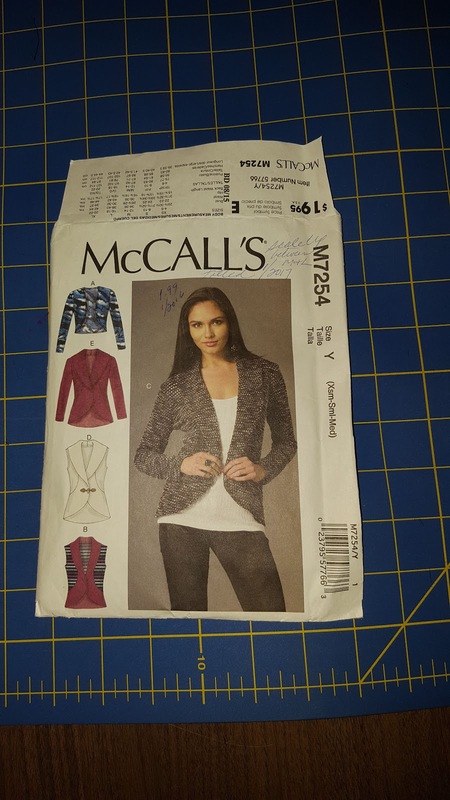 This pattern is described as: Unlined cardigans are close-fitting. A, and armholes B, D: Narrow hem. B: Contrast panels. D: Purchased toggle closing and sleeveless. 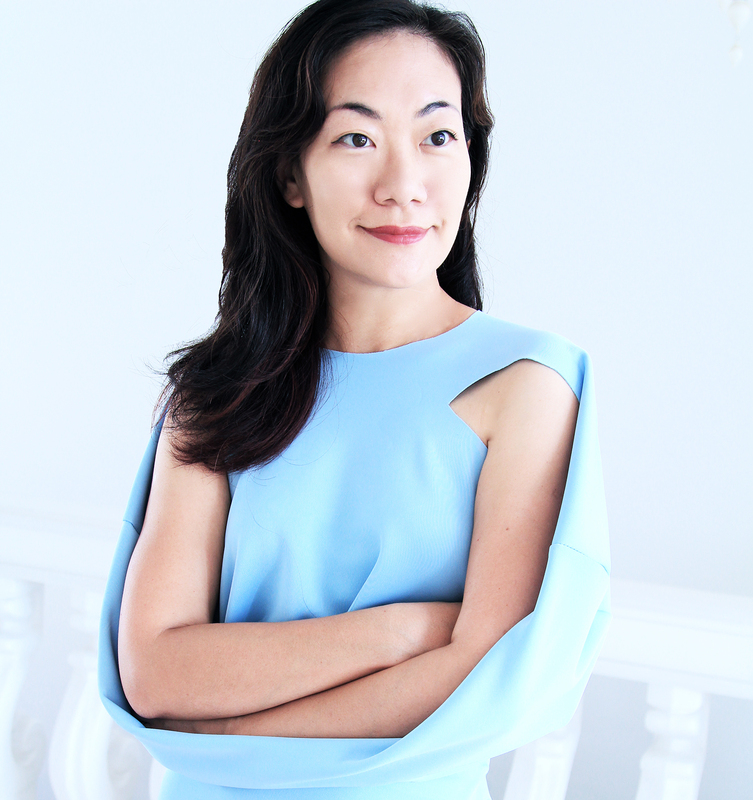 B, C, D, E: Self-lined front (extends into shawl collar variations) and back peplum. A, C, E: Stitched hem on sleeves. Note: No provisions provided for above waist adjustment. It's available in Multi-size groups (XS, S, M) and (L, XL, XXL). I used medium with modifications. On the McCall website, the sizing is indicated as 4- 22. The instructions were typical. Nothing confusing in them. 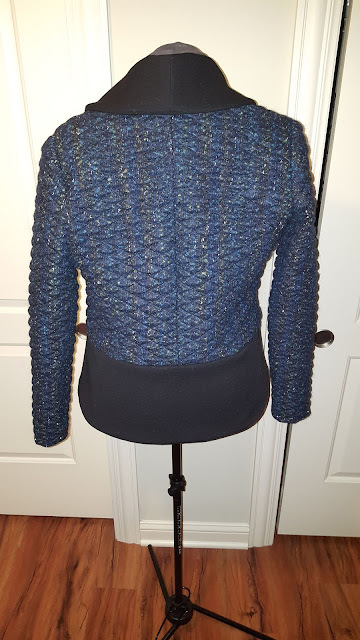 Before cutting my cardigan/jacket, I made my usual pattern adjustments starting with the FBA on the side front. Then adjusting the front to ensure a smooth joining of the two. Lastly, I made a swayback adjustment with a center back seam. 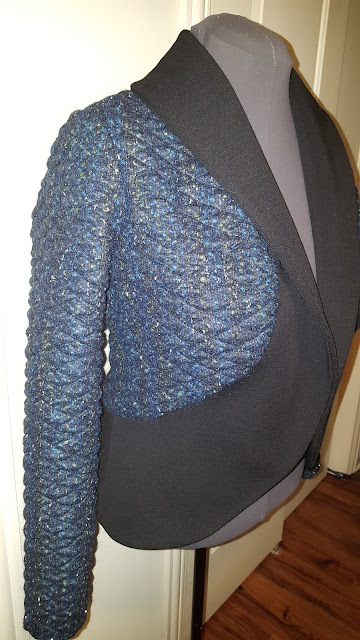 The cardigan/jacket went together with no problems. In the bust area I eased in more of the excess at the curve to allow for enough wearing ease across the bust. 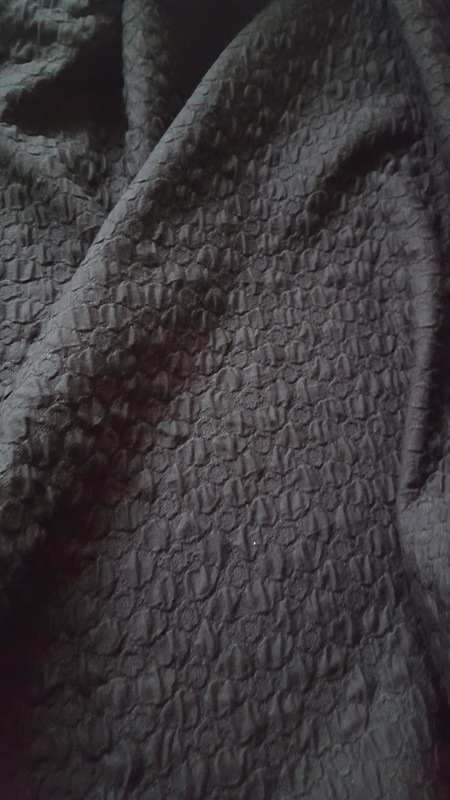 My fabric is a quilted coating from Mood Fabrics and black knit coating remnant from this coat project. I love the combination of the two. It makes my cardigan/jacket more structured. I like this pattern for the collar, front, and peplum look. 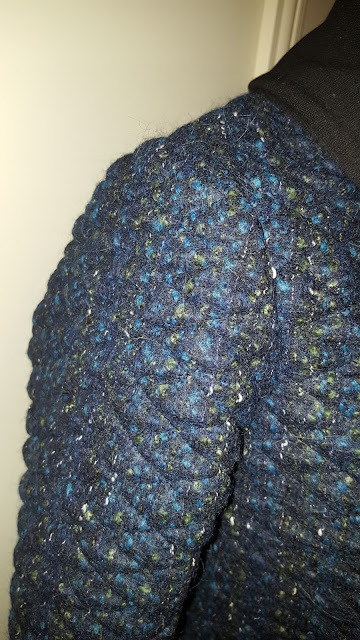 The sleeve are very narrow, especially below the elbow. So if you're planning to make this, make sure you measure the circumference of the sleeve to ensure you have enough room. My jacket is almost finished. I decided to add a lining. 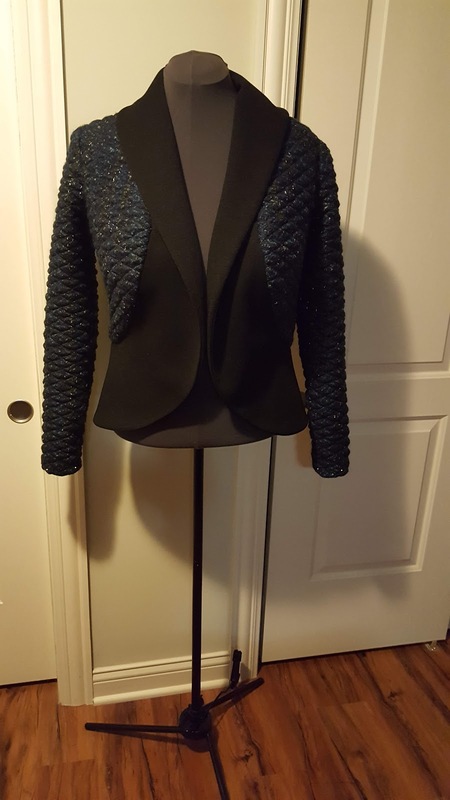 So once that's done, the jacket will be completed. It's possible that I will make it again. 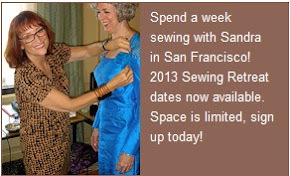 And I do recommend it to sewists. 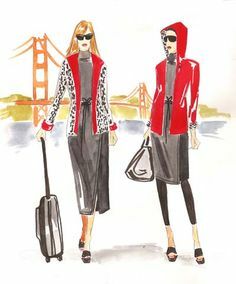 Most would like to believe that ponte knit is just plain ole common fabric used in simple or fast fashion. But that's not true of Mood's Stretch Ponte Knit. It is superb. I love it and want it in every color. It's so amazing. The hand is soft and smooth. The feel is similar to scuba knit. Using a microtex needle this dreamy fabric sews up with no skipped stitches. Today, I'm featuring two of the three pants that I made using Christine Jonson center seam pants from her Travel Trio 1 pattern collection. The marrying of the pattern and the ponte knit was perfect. 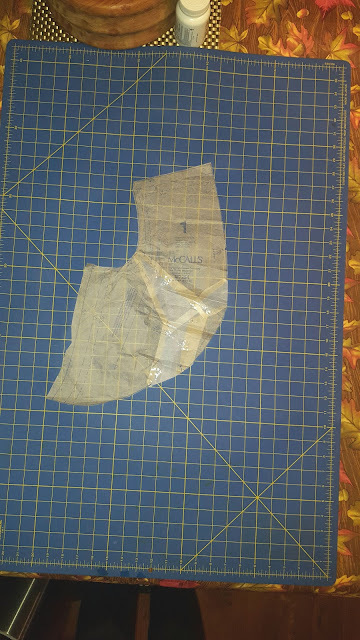 The sewing process was quick and easy. 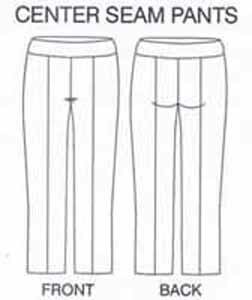 The result is two great pair of pants. I decided to play up the center seam with some top stitching. This is a nice little detail to show off the seaming. I almost love the pant leg shaping; not to skinny and great for wearing boots. These pants can take you from casual work gear to night out on the town. In the picture above, you can see I didn't do due diligence with the pressing. But I'll take care of that later. NOTE: be careful when you press. The high synthetic fiber may be a little challenging. This certainly will not be the last time I purchase Mood's ponte knit. I want it in every color. I invite you to try it. You won't be disappointed. There are ten delicious colors available at the Mood online store.